No need USB connection to operate Clone function and copy mass data without PC, the process will show on the LED's light flash. 4. 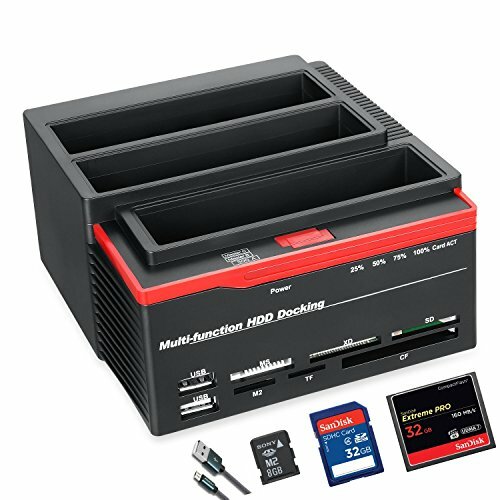 No tooling required to connect the hard drives and SSD, makes data transferring easy. 4.Please backup files in the target hard drive before cloning. Any files in target hard drive will be overwritten when offline cloning occurs. 5.To avoid data transfer errors, overheating and damage to the device please make sure that there are no faulty driver cells. 6.To avoid data loss, do not remove or insert drives when one drive is working in the docking station. Please power off the docking station before removing. 7.please read the manual carefully before using the clone function. If you have any questions about this product by FUHAOXUAN, contact us by completing and submitting the form below. If you are looking for a specif part number, please include it with your message.